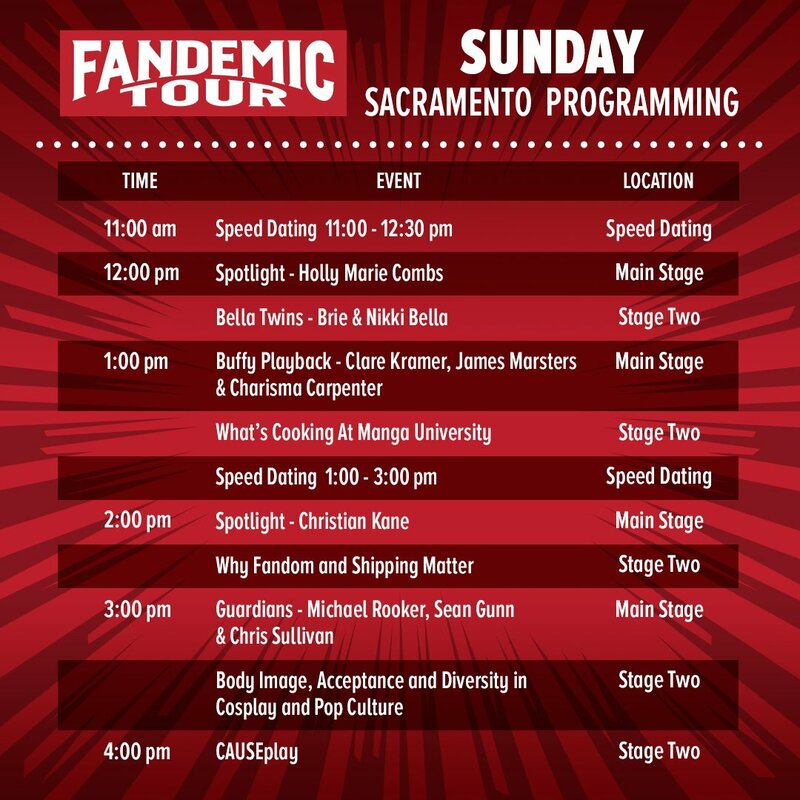 Want to win a 4-pack of tickets to FANDEMIC TOUR Sacramento? You have come to the right place. This show is run by the former CEO of Wizard World so a similar footprint but an all-star celebrity lineup featuring celebs from This is Us, The Walking Dead, Guardians of the Galaxy, Gilmore Girls, Power Rangers and so much more!! Sunday - kids FREE craft handed out, while supplies last! Winner can pick to attend on Friday or Sunday. Fandemic Tour, a new type of comic con, will bring theirnew tour to Sacramento this June. Brought to you by the same people who originally created Wizard World Comic Con, Sacramento will be their very first official city stop, followed up by Houston, Sept. 14-16, 2018 as a make-up due to Hurricane Harvey. 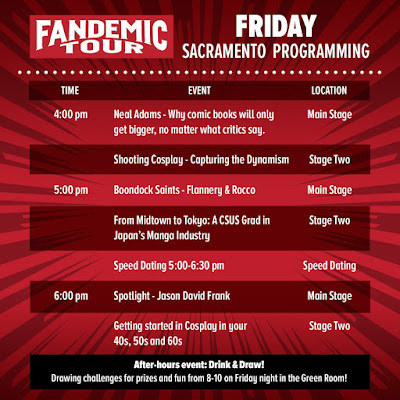 Fandemic Tour will feature celebrities including: Norman Reedus (“The Walking Dead”, “TheBoondock Saints”), Jeffrey Dean Morgan(“The Walking Dead”, “Magic City”), Michael Rooker (“Guardians of the Galaxy”, “The Walking Dead”, “Tombstone”,“Cliffhanger”, “Days of Thunder”), Sean Gunn (“Guardians of the Galaxy”, “Gilmore Girls”), Milo Ventimiglia (“This is Us”, “Heroes”, “Gilmore Girls”), Dave Bautista (“Guardians of theGalaxy”, “WWE Raw”, Sean Patrick Flanery(“The Boondock Saints”, “Powder”) and Jason David Frank (“Mighty Morphin Power Rangers”). 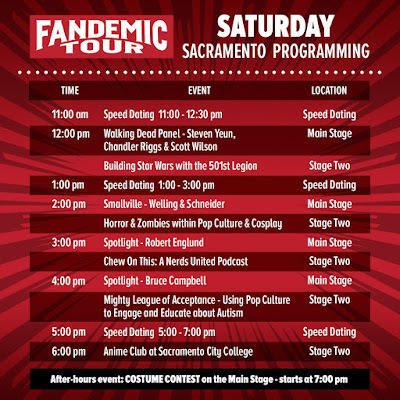 Fandemic Tour is a brand new experiential convention weekend that will bring together celebrities, well-known and emerging comic artists, cosplayers of all shapes and sizes, and exhibitors with merchandise designed to offer something for every type of pop culture fan. All confirmed talent will make appearances on at least two days of the weekend, and many will appear on all three days. All guest appearance dates are listed at www.FandemicTour.com. In addition to celebrity acting talent, Fandemic Tour will boast a host of exciting guest artists such as Neal Adams (Batman, X-Men), Phil Ortiz, animator from The Simpsons and Muppet Babies, Michael Golden of Marvel and DC Studios fame, Rob Prior,amazingly talented two-handed live pop artist with notable credits (Game of Thrones, Star Wars: The ForceAwakens), and Arthur Suydam (Deadpool, The Walking Dead).Other notable artists including: Renee Witterstaetter, Mike DeCarlo, John Beatty, Rodney Ramos, Ric Meyers,Clinton Hobart, Rags Morales and Jim Salicrup. During the weekend,Fandemic Tour bring back the fan favorite Friday night “Drink and Draw”, afestival component that will allow fans to mingle, receive drawing instructions from an expert artist, and have an all-around fantastic evening of revelry while imbibing their favorite adult beverage.Saturday night will showcase one of the highlights of the weekend in the formof a Costume Contest, which will begin at 7:00 PM when the show floor closes. Guest judges will critique the best of the best in the cosplay world.The Costume Contest is open to all who are interested in participating. Fandemic Tour willcontinue to announce additional big-name guests in the coming weeks leading upto its inaugural event, June 22-24th at the Sacramento ConventionCenter in Sacramento, Calif.
• Friday, Saturday, and Sunday admission for one individual to Fandemic Tour. Note that wristbands may not be shared among multiple people. If you remove your wristband, we will NOT replace it and you will not be readmitted. Admission is for the same individual on multiple days. • Early admission (30 minutes before general admission) on both Saturday and Sunday. • One Photo-op with your chosen celebrity, 8 x10’ printout. Digital image is available separately. Photos are printed on8×10” paper on dye-sublimation photo printers. Most guests are available for at least twoof the three days of the event, and all appearance dates are spelled out on the Fandemic Tourwebsite, www.FandemicTour.com.